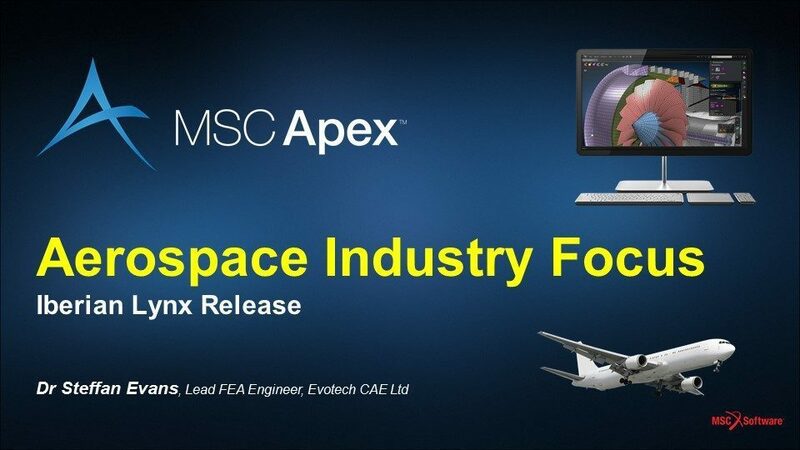 Apex Webinar Series - MSC Apex/Nastran Workflow Efficiencies for the Aerospace Industry | Evotech Computer-Aided Engineering Ltd.
A recording of this webinar (originally presented on Thursday January 17th 2019) is available here. CAE simulation offers massive product development power in the aerospace industry, but legacy methods can be incredibly laborious and require expertise to deliver results. Users are therefore constrained and suffer from low productivity as well as the potential for human error. MSC Apex is a powerful tool that allows engineers at all-levels to enhance their daily productivity, thus allowing companies to develop better products, faster. Join us in this live webinar and experience how MSC Apex Iberian Lynx can boost your day-to-day productivity and push the frontier of your innovation. The webinar will focus on how Apex can be used in a Pre-/Post-Processing workflow for MSC Nastran, coupling design and analysis automation with orphan mesh manipulation within the aerospace industry. MSC Apex now offers the new “Apex-Nastran-Apex” workflow and improved ‘Pre-/Post-‘ functionality for FEA. The Iberian Lynx release allows users to combine the generative modeling capacity of Apex with the analysis power of MSC Nastran, the most trusted multi-disciplinary FEA solver in the industry, to perform accurate analysis often with over a ‘10x’ productivity enhancement. Evotech Computer-Aided Engineering Ltd is an Engineering Consultancy and MSC Apex Elite Partner based in the UK, specialising in Product Development, Technical Sales and Training in advanced Finite Element Analysis (FEA). With a background predominately in the Aerospace industry, Evotech CAE are expert in multi-scale model development, analysis and structural optimisation. Evotech CAE's Director and Lead Engineer, Dr Steffan Evans, has over 20 years experience of advanced FEA and holds a Doctor of Engineering degree in Structural Optimisation, Chartered Engineer Status, and NAFEMS PSE Certification at advanced level (including Non-Linear Analysis, Composites, Optimisation and FE Model Verification).